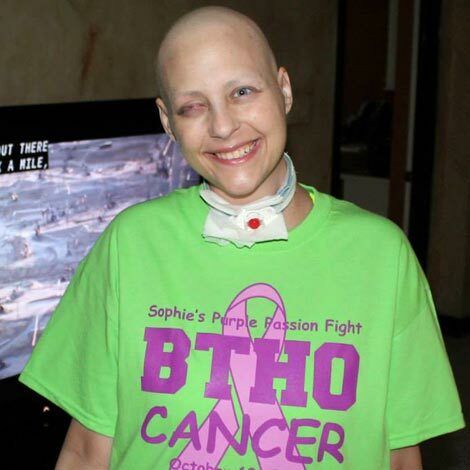 I was diagnosed with stage 3B Hodgkin lymphoma in February 2013. I was having unusual things going on with my body such as itching, weight gain, swollen lymph nodes and heavy breathing. As these symptoms continued, it led me to go see my general practitioner, who misdiagnosed me with scabies (a form of bed bugs). After another week of being miserable, and no change in my symptoms, I decided to go see my dermatologist. When I went in he knew right away something wasn’t right and sent me to get blood work done immediately. The next day he called and told me he was referring me to an “oncologist.” (At this point in my life I had no idea what an oncologist was). The oncologist immediately had me see an ear, nose and throat doctor to schedule a lymph node biopsy, performed a bone marrow biopsy and sent me to have a PET scan all within a matter of days. On February 19, 2013, my world as I knew it forever changed. By now, Aaron (now my husband) and our families knew it could be a serious infection or even possibly cancer, and my lymph node was sent to a pathologist to find out what was going on. When the lymph node was removed during surgery, my airway collapsed (later to find out it was because of my football-size mass). Within the next four days, as I waited for a room in the intensive care unit, I had a tracheotomy and was put into a medically induced coma. After being life-flighted to the medical center, my team of doctors/nurses at Methodist didn’t waste any time. Within the first 48 hours, I had a stint put in my airway and emergency chemotherapy began on February 22, 2013. I spent six weeks in a medically induced coma. When I woke up in late March, I seriously thought I was in the recovery room after my lymph node biopsy, and was shocked to find out it was six weeks later and I had already had four rounds of chemo. From March to the end of October I fought to save my life. I managed to recover through several infections, a hospital bug, learning to eat, walk, write and talk again, having to shave my hair off, 12 rounds of ABVD chemotherapy, and countless hours of physical therapy. I completed my 12th chemo on August 14, 2013. The happiest day of my life came two weeks later when I was officially declared CANCER FREE by the BEST oncologist and the man who saved my life.